This past weekend, you may have seen on Instagram that we celebrating my daughter Amelia’s 4th birthday at Disneyland Resort (no surprise there, it’s where we’ve celebrating her birthday every year)! We went really big for her birthday this year, where in previous years we typically just went to Goofy’s Kitchen we added some more magic for her weekend long birthday celebration. Since Disneyland Resort is obviously a popular place to celebrate a birthday party, I wanted to pass along what we did to help give inspiration, tips, info and ideas when you celebrate your child’s birthday at the happiest place on earth! Yes, yes, I know that’s a lot…my daughter and I tend to be high energy and do a lot! Depending on the time you have, you certainly don’t have to do all these, but rather this post is to help give ideas and tips! Have about $20-$25 in cash taken out. For balloons at Disneyland, they only accept cash. For leftover cash, I like to use the change machine inside the Great Moments With Mr. Lincoln lobby to use to get souvenir smashed pennies. This way my daughter can get little mini birthday surprises throughout the day! She loved carrying around a little purse to keep them in. Make reservations at Bibbidi Bobbidi Boutique by calling (714) 781-7895, you can do it up to 60 days in advance. I highly recommend making it ASAP before spots fill up! You can check out the different packages here. Make a reservation at the restaurant of your choice. If you want to do a character dinner, PCH Grill at Paradise Pier Hotel, Goofy’s Kitchen at Disneyland Hotel, and Storytellers Cafe at Grand Californian are your options. Our personal favorite is Goofy’s Kitchen, since we love the atmosphere and photo op with Chef Goofy, Mickey, or Minnie before your dinner. You can make the reservation online up to 60 days ahead of time, and the sooner the better since they fill up! If you want a custom ordered cake (I highly recommend, seriously their cake is in my opinion the best cake I’ve ever had) you can do so by calling the Disney Dining Line at (714) 781-DINE. In the morning, we parked at Howard Johnson Anaheim (where we were staying that night). They let you park there earlier, so you don’t have to move your car from the structure to the hotel later in the day. Super convenient! Just go to the front desk and let them know you’re staying there that evening and they’ll provide a parking pass. TIP: If parking and staying at Howard Johnson, ask for a complimentary pirate hat and pirate sword balloon! It was a great little surprise to start the morning with, and my daughter enjoyed wearing it in the parks prior to her Bibbidi Bobbidi Boutique makeover. Then we walked over to Disneyland, where we went to Disneyland City Hall, and asked for a complimentary “Happy Birthday” button, and asked if Amelia could get a birthday call (City Hall cast members hand your child the phone, and Goofy will sing Happy Birthday to them)! Next, we headed to find some characters along Main Street USA to do meet-and-greets with. TIP: I think the morning is the best time for a meet-and-greet, since the lighting is nice (overcast typically), and the parks aren’t quite as busy. Wait by the blue wall near Mad Hatters to catch the characters when they first walk out. Sometimes they’ll spot your child and walk hand-in-hand with them until they get to their meet-and-greet spot. After that, we then went to go find balloons! Something to note, they typically have the balloon sales people walking around starting at 11:30am. Also, you can only find balloons along the parade route (so in between Small World through the end of Main Street), you won’t find them in any of the other lands. TIP: We’ve had luck finding the Kingdom Cutie balloons near the Storybook Canals in Fantasyland, if that’s what you’re looking for! Since we had a big dinner ahead of us, we grabbed a light lunch at Red Rose Taverne. Other favorite quick places are the new Tropical Hideaway in Adventureland and Jolly Holiday. Then it was time for Bibbidi Bobbidi Boutique! We paid for the Minnie Dot Package, which I adored! And you don’t see too many girls who do that package, so was a bit different. You can check out more Bibbidi Bobbidi Boutique details on my post dedicated to it. TIP: If you have one, I would bring a DSLR camera with a flash into Bibbidi Bobbidi Boutique. The “Fairy Godmothers in Training” who do the makeovers work fast, so it’s hard to capture non-blurry photos on a camera phone. A DSLR with flash (since the indoor lighting is dim) captures the moments quick without blur. After she got her makeover, we headed to Toontown so that Amelia could get a picture with Minnie dressed up as Minnie! She was so excited to “twin” with her! Although we could also do the meet-and-greet on Main Street, the meet-and-greet at Minnie’s house in Toontown is extra special since as you’re walking through the line you get to explore Minnie’s house. Then the photo op itself is very immersive, with a heart-themed backyard complete with bistro tea set! We then headed to Goofy’s Kitchen! A tradition that we do every year. TIP: No need to arrive early, arrive just on time, since they are typically fully booked so it’s rare they can seat you early. Once we checked in, Amelia got her photo taken by a Photopass photographer. You get a photo with either Chef Minnie, Chef Mickey, or Chef Goofy. 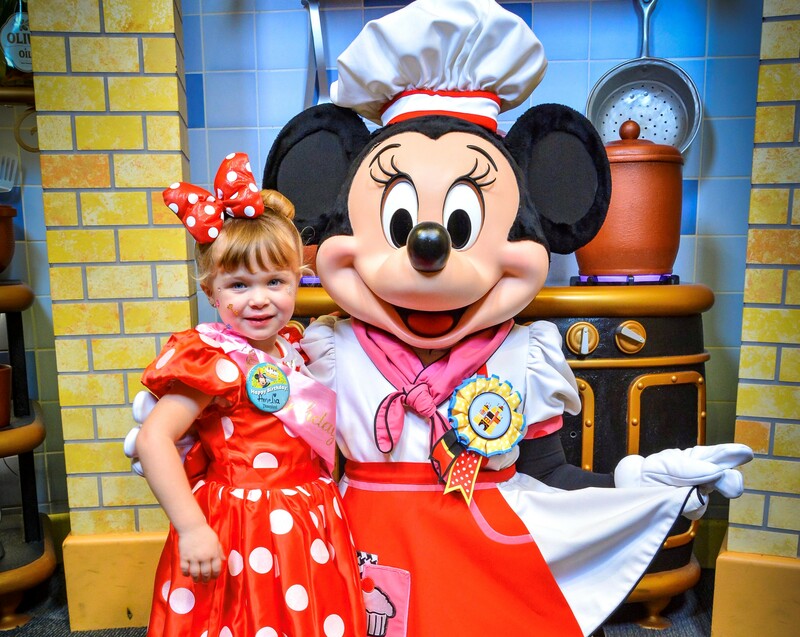 We were lucky enough to get Chef Minnie, which was perfect since Amelia was in her Minnie Bibbidi Bobbidi Boutique look! Once seated, you receive special Goofy’s Kitchen buttons. Once your drink order is taken (they also offer alcoholic beverages, in case you were wondering), then you are free to get your dinner at the extensive buffet! As you eat, Goofy, Mickey, Minnie, Pluto, Chip, & Dale periodically dance around the restaurant. They encourage you to join in by clapping or waving your napkin in the air! Aside from the dancing, of course the main appeal of Goofy’s Kitchen is the characters coming around to each table to do individual meet-and-greets. They really take their time interacting with the children, making them feel extra special! TIP: We forgot our autograph book for the characters, but since we get adorable paper placemats themed to Goofy’s Kitchen at our table, we asked the characters to sign those! It made an adorable souvenir to frame! After we ate, we received the cake I had custom ordered from the Disney Dining Line! I picked out a chocolate cake with chocolate mousse, decorated as Minnie. When I called, I was very impressed with their flavor and design options (they even have pineapple and churro flavors). TIP: Before they bring your cake, I recommend letting them know you’ll want the cake box at the end. We almost always have to take at least half to go, and sometimes they have accidentally gotten rid of the box. They can bring you other to-go boxes to divide it up in, but it’s easier to transport in my opinion in the cake box. After Goofy’s Kitchen, we walked over to our hotel, Howard Johnson Anaheim, for a slumber party! Since kids can have a hard time leaving Disneyland, I planned ahead of time to have a couple little surprises at the hotel to continue the birthday magic. I found on shopDisney a Huey doll on clearance for $3, along with DuckTales pajamas also on clearance. DuckTales is her favorite show, so was super excited to surprise her! She eagerly got on her pajamas, jumped on the bed a bit, then we watched the fireworks from our balcony at Howard Johnson! TIP: If you’re staying at Howard Johnson and going to the parks the next day, before you leave to go to the parks you can go to the front desk to request they extend your parking pass up until 6pm (typically it’s until 3pm) if you need more time in the parks! And there you have it! Our weekend celebrating a birthday at Disneyland Resort! I hope you find these tips helpful, feel free to send me a Tweet to share your own birthday Disneyland experience or to ask me questions! To book discounted park and hotel ticket packages, click here. To make reservations at Goofy’s Kitchen up to 60 days ahead of time, click here. To view the different Bibbidi Bobbidi Boutique packages, click here. To learn more about Howard Johnson Anaheim, click here.